Students from Berkeley College provided assistance to Lord & Taylor’s stylists during “The Dress Address Style Event,” held at the luxury department store’s location at the Fashion Center Paramus in Paramus, NJ, on April 1, 2017. 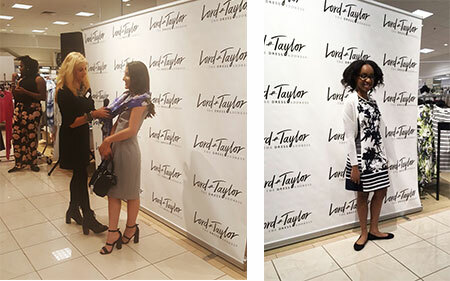 During the event, students helped model and stylize outfits and accessories to show an audience of Lord & Taylor’s customers ways to transition a single dress into multiple looks. Many of the student volunteers were members from the Berkeley College Fashion Club in Paramus. The student-run organization arranges events and charity initiatives that provide students ways to explore their interest in the fashion industry. 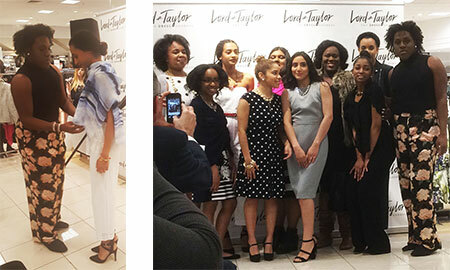 “Getting the chance to interact and learn from Lord & Taylor’s staff and stylists gave us all a first-hand look at what goes into putting together such an event,” said Morgan Wilson of Hackensack, NJ, President of the Berkeley College Fashion Club in Paramus. The Berkeley College Fashion Club is comprised of students from all majors. However, many of the Club’s members are enrolled in the Berkeley College Fashion Merchandising and Management program, which integrates the creative and business aspects of the fashion industry with current technologies, covering the complete fashion global supply chain. Click here to learn more about the Berkeley College Fashion Merchandising and Management program. (Top) Berkeley College students Yasmin Lomas of North Bergen, NJ, (left) and Kayla Toney of Hackensack, NJ, (right) model during Lord & Taylor’s “The Dress Address Style Event,” held at the Fashion Center Paramus in Paramus, NJ, on April 1, 2017. (Above) On the left, Morgan Wilson of Hackensack, NJ, helps fellow Berkeley College student Lizbeth Perez of Dumont, NJ, rearrange her outfit during Lord & Taylor’s styling event. On the right, students from Berkeley College take a bow during Lord & Taylor’s “The Dress Address Style Event,” held at the Fashion Center Paramus in Paramus, NJ, on April 1, 2017.